A high-performing risk-based team requires a mix of skills in governance, risk, audit, compliance, ethics and IT (we use the acronym GRACE-IT to remember them all). Finding and selecting the right folks in these diverse disciplines can be hard -- but it doesn't have to be! 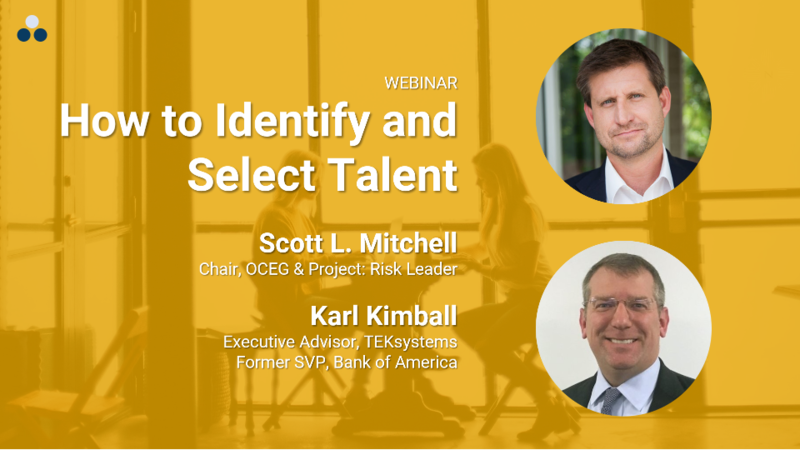 Join Scott Mitchell, chairman of OCEG and the Risk Leader Advisory Board; and Karl Kimball, former SVP at Bank of America and current Executive Advisor at TEKsystems as they walk through 5 simple steps to get better people on your team. Learn how to identify and select the right kinds of people to create a high-performing team ... and to GET WORK DONE! Understand how to plan for your talent needs. Understand several effective channels for attracting / hiring talent. Understand how to select good partners.